No surprise, the +/- shows what we all saw. Dotson and Grimes had great numbers and Vick and Moore had terrible numbers. Actually, Moores numbers were by far the worst. Dedric also had good numbers. 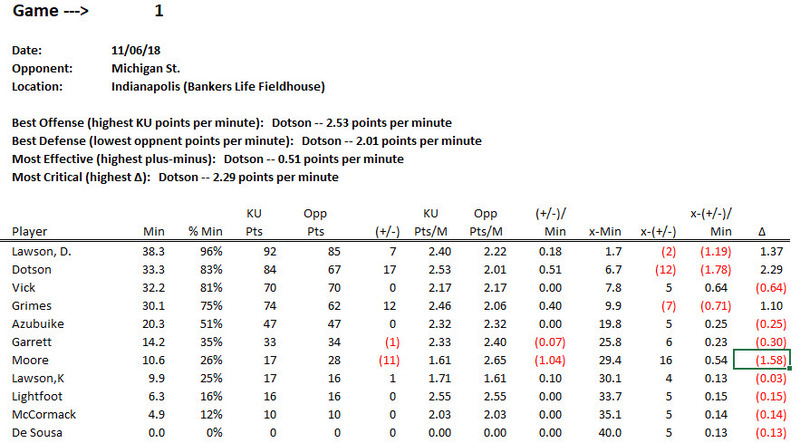 The Jayhawks were outscored with Moore on the floor by 1.04 points per minute. Good thing Moore only played 10 minutes. Dotson was by far the most critical player. The difference in scoring between Dotson in the game and on the bench was 2.29 points per minute. Dedric was second and Grimes third. I'll give Moore a pass since it's his first game with KU and everyone is due an off night. I'm less inclined to give Vick a pass. He's a senior and knows the system, yet demonstrates little/no leadership and mediocre effort. On one hand I feel bad for the kid, but if he doesn't "get it" then I don't know why he's on the floor.